Actress. A glamorous blonde who earned numerous credits over a long career, she shall be remembered as Sharron Macready, a secret agent on the late 1960s science fiction series “The Champions”. Raised in Brighton, she wanted to be a veterinarian from the time she was three but while still in her teens was ‘discovered’ and cast in the 1963 horror flick “13 Frightened Girls!”. Alex passed-up her chance at college and began a show business career which kept her busy on the big and small screens. 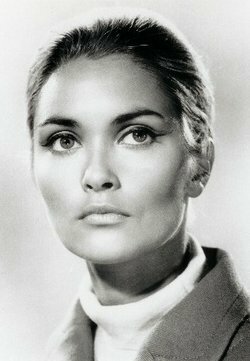 Seen in episodes of “The Saint”, she had parts in 1965’s “The Liquidator” and in the 1967 Bond movie “Casino Royale” prior to landing the role of Sharron on ITV’s “The Champions”, a series which developed an ongoing cult following. Fluent in multiple languages, Alex appeared in a number of Spanish films, earning the nickname “La Bastedo” and even landing part-time translating assignments for the Prime Minister and gigs as M.C. at the Miss Universe and Miss World contests. Thru the 1970s she was seen in the series “Codename” as well as in such films as “The Blood Spattered Bride” (1972) and 1979’s “The Aphrodite Inheritance”, along the way attracting romantic advances from a number of high profile admirers; married to director Patrick Garland in 1980, she more-or-less retired and fulfilled her early ambition by founding a West Sussex animal sanctuary which she and a team of about 60 volunteers ran. Alex continued to make occasional appearances, reprising Sharron for 1983’s “Legend of the Champions” while appearing in the 1984 television movie “Draw!” and in the series “Absolutely Fabulous”. She published a 1993 memoir entitled “Beware Dobermans, Donkeys, and Ducks”, was a society matron in the 2005 feature “Batman Begins”, earned her final credits on 2008 episodes of the classic “EastEnders”, lived out her days in West Sussex, and died of cancer. At her death numerous DVDs documenting her art were available.